A lowly warehouse in Antwerp may not seem like a life-changing sort of place. However, this was the start of a completely new life for over 2 million immigrants and a lifesaver for many of them. 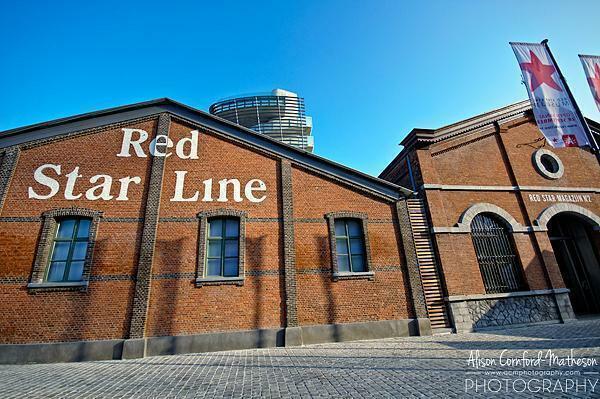 The brand new Red Star Line Museum in Antwerp, tells the story of these immigrants, who bravely travelled from Eastern Europe to North America, leaving everything they knew behind. As expats, the topic of immigration is close to our hearts. We know how hard it was to move overseas, away from friends and family. 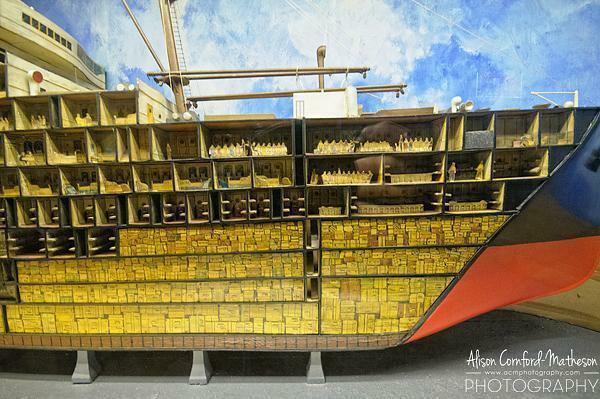 We didn’t have to board a ship which would take weeks to cross the Atlantic. We weren’t fleeing persecution for our beliefs. We didn’t have to leave our home at all – it was our choice. Still, it was one of the hardest, scariest things we’ve ever done. To put ourselves in the shoes of the immigrants who passed through the doors of the Red Star Line (RSL) complex is nearly impossible. Many were Jews fleeing almost certain death. Others were simply longing for more opportunities for their families, in a land they knew little about. They travelled overland for days, even weeks, from all corners of Europe, to reach Antwerp, where they waited to learn their fates. Not everyone was permitted to board the Red Star Line ships and waiting in the RSL terminal was filled with anxiety. Medical checks were rigorous and potentially humiliating. Those who did get the go-ahead, travelled to New York City, where they disembarked at Ellis Island. Others landed in Boston and Philadelphia. I was surprised to learn RSL ships also landed in our hometowns of Halifax and Saint John. Although it’s the very first incorporated city in Canada, Saint John is not a location often marked on maps in Europe. Seeing it on the wall of the RSL Museum was particularly touching for me. Emigrants from all over Europe headed to America on RSL ships. 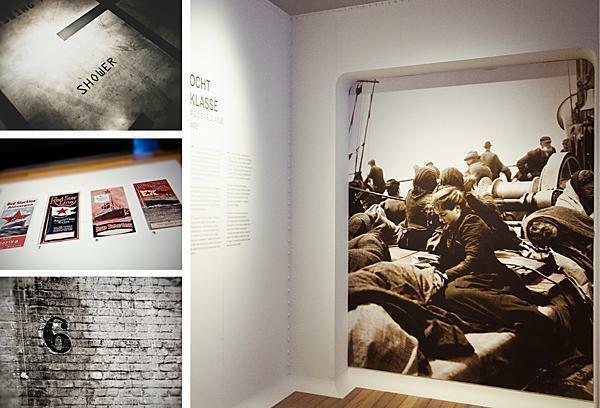 But nothing was as touching as the stories of the immigrants portrayed throughout the RSL Museum. 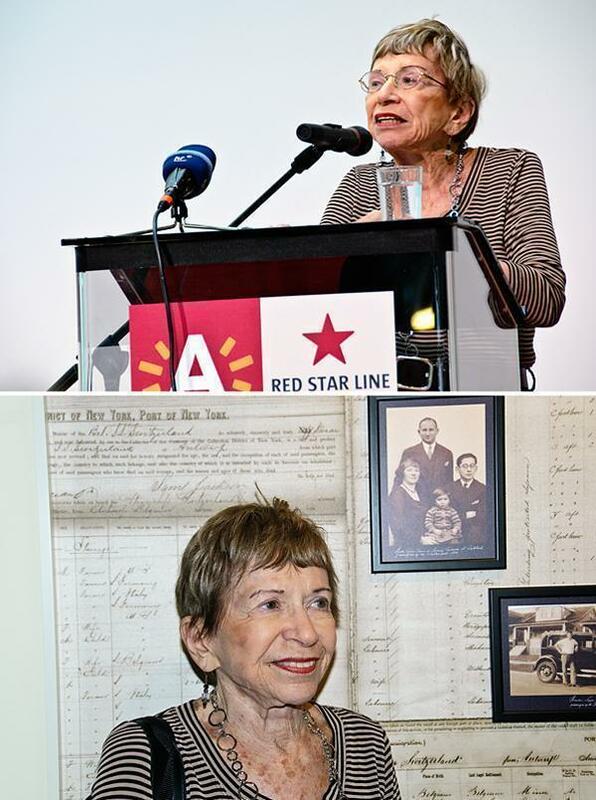 Because, overall, this is not a museum about a shipping line, it is a museum about people; People like Sonia Pressman Fuentes, who spoke at the Red Star Line Museum opening. Sonia Pressman Fuentes is one of the last surviving RSL passengers. Top: Sonia speaks at the RSL Museum opening. Bottom: Sonia stands beside a photo of her with her family before boarding the RSL ship to New York. Sonia was only five years old when she travelled with her brother and parents to New York, but it changed the course of her life and the lives of all the people she touched. Sonia is one of the last surviving immigrants who travelled on the Red Star Line from Antwerp. Although her family was fleeing Berlin, they didn’t intend to go to America. In fact, they hoped to settle in Belgium. When their visas were rejected and the family was threatened to be deported, the Red Star Line was their last hope. Sonia doesn’t actually remember the crossing, but was told many stories by her family. She went on to become a lawyer and one of the leaders of the Women’s Rights movement in America. If her family had stayed in Europe, they surely would have faced the concentration camps. Sonia and her family were just four of the millions of passengers who left Antwerp on RSL ships between 1873 and 1934. 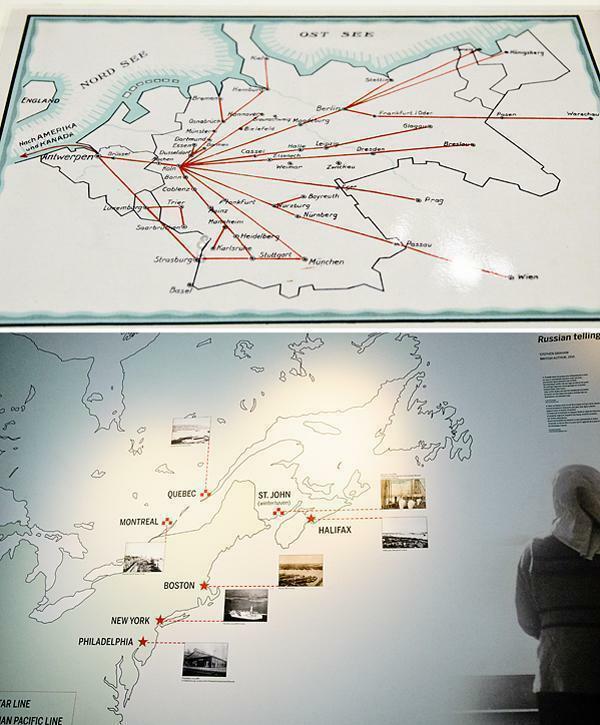 The majority of the passengers were Eastern European Jews but there were 200000 Belgians on the passenger lists also. It wasn’t an easy crossing for many of the RSL passengers. Among the RSL passengers are some famous names. Albert Einstein was a frequent client of the Red Star Line. He famously wrote his resignation letter, to the Prussian Academy for the Sciences, on RSL stationary. (It’s on temporary loan to the RSL Museum). He and his wife, Elsa, made their final escape to America on the RSL ship, Westernland. Irving Berlin, the composer of ‘White Christmas’ and ‘God Bless America,’ sailed to America on the Rhynland, at age five. One of his pianos is on loan to the RSL Museum, from his daughter, and takes pride of place in the collection. The warehouse building itself is also an import piece of the Red Star Line story. The buildings had fallen into disrepair and were threatening collapse. The architectural firm responsible for restoring the warehouse buildings and creating this stunning museum is Beyer Blinder Belle; the same firm responsible for the Ellis Island Museum. Beyond restoring the warehouses, where the third-class passengers passed through, the firm also created the striking observation tower, which resembles a ship’s smoke stack. 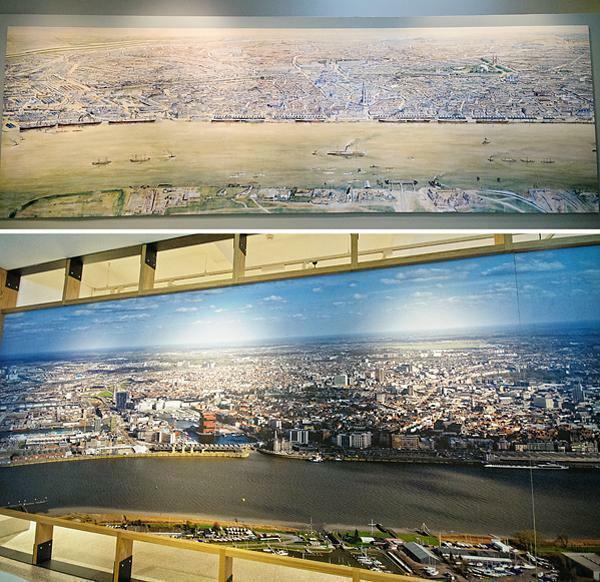 The view of the Antwerp skyline was the last thing many immigrants would see before landing in the New World. 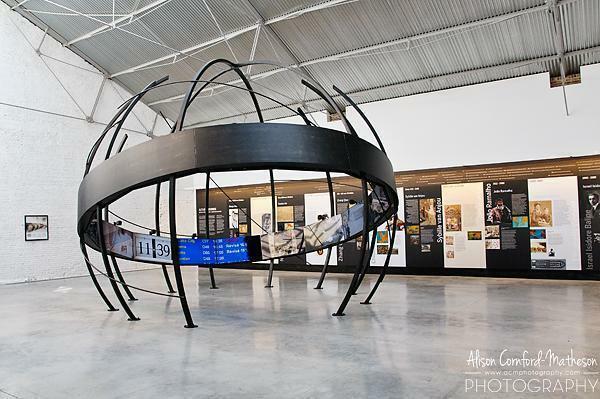 Although the Red Star Line Museum primarily focuses on the immigrants who travelled on board RSL ships, there is also a modern side to the story. On the ground floor, the exhibit ‘Always on the Move’ deals with the current state of migration around the world. 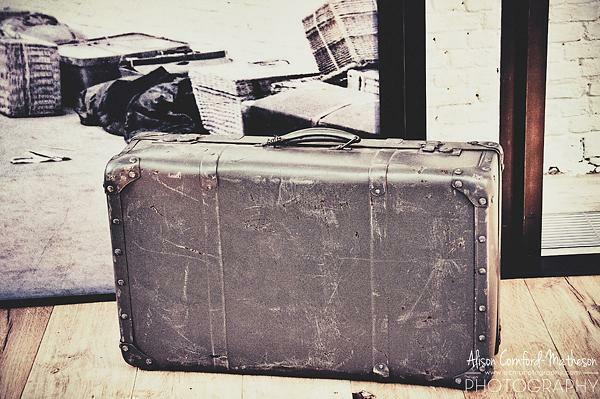 Coupled with temporary photography exhibits, this modern section of the museum reminds us that, even today, immigration isn’t always a choice for the migrants. 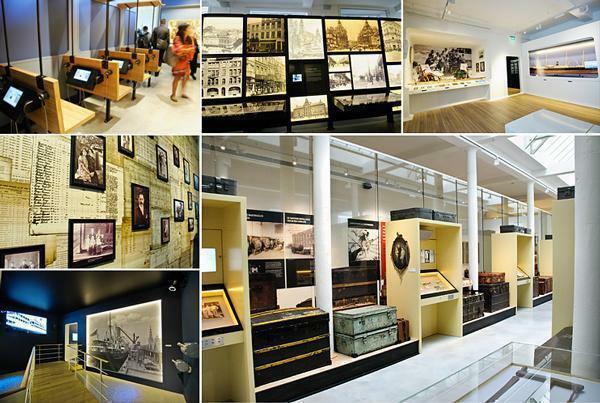 The Red Star Line Museum tells a powerful and important story in a beautiful and moving way. It should be on the ‘must visit’ list for all expats and descendants of immigrants, so we never forget the struggle our ancestors made on our behalf. Tuesday – Friday: 10 a.m. to 5 p.m.
€ 6 – senior citizens (+65 years) and groups of 12 or more visitors. 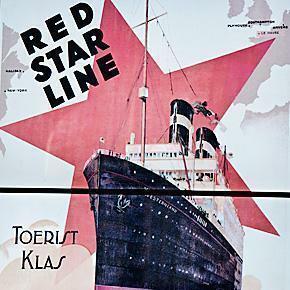 A combination ticket is available for the Red Star Line Museum, Museum Plantin-Moretus, Museum Eugeen Van Mieghem (valid from 28 September 2013 to 5 January 2014) for € 12.